Food production and consumption have a big impact on society, soils, ecosystems and biodiversity, and on climate change. Until now, most scientific investigation of growing practices that can lessen negative impacts and even help to regenerate soils and ecosystems have been at the larger farm scale. However, we know that many of these regenerative approaches are practiced at the smaller scale and that individual growers can find these beneficial. So GROW developed this experiment to investigate this. 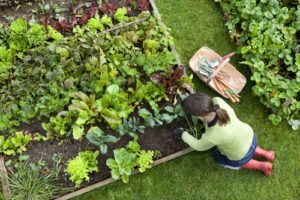 Polycultures – growing several crops together at the same time – have been shown to have benefits in terms of crop yield, resilience to pests and disease, and enhancing wider biodiversity. However, mixes of three or more crops have not been extensively studied and much remains unknown. This experiment will help you to discover what works best in your own plot. You could also encourage other growers in your community garden or allotment to take part and compare your results. Experiments are even more valuable when several people take part as we can be more sure results are not due to chance. What do we want to find out about? 1. Is there a difference in yield of beans, spinach and radish when grown as a polyculture compared to when grown as monocultures? We also want to consider other factors that can affect plant growth. When we cannot control for these, we need to record them so we can understand if and how they influence our results. At the start, we suggest you describe your plot using some simple observations. These are: light/shade, canopy cover of trees and shrubs, slope position, angle and aspect. Below you will find guidance on how to measure these. As we progress, we will introduce some other observations that can help you understand more about your plot. Before getting started, please read the GROW safety guidelines.